My friend, Dana, is going to welcome her second child this month -any day now, in fact! I can't wait to find out if this little pumpkin tummy of hers is a boy or a girl. Sweet Annaliese probably isn't aware of how her life is about to change and would likely be happy if mommy was actually growing her a pretty little pumpkin of her very own. I would have let her keep this one (she so adorably loved it) but unfortunately I had to return it to the neighbor's porch from where I had stolen borrowed it for our photo shoot. A photo shoot, by the way, that was made perfectly easy by this glowing mama, her precious baby girl and a beautiful baby bump that hopefully will not keep us guessing for very much longer. 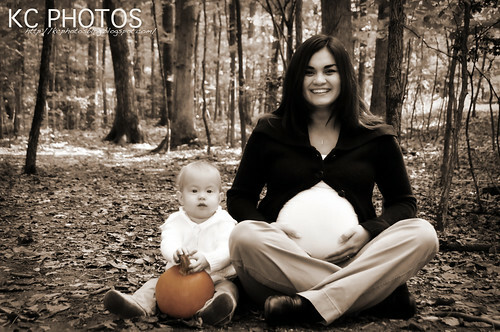 I'll post some photos from our autumn portrait session over here and of course over there too. ARG! Why do I live so far away from you? :-( great photos!